In all the years of running, I have never been truly free from cramps. The longest I was on my feet running was the 7.5hr at Pedernales trail last month. 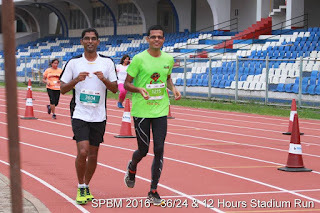 For me, the stadium run was a chance to push beyond, keep variables to a low and experience the joy of running beyond 8hrs. If cramping was a result of an involuntary nervous stimulus, I wanted to change that. I relied on Pranayamas to relax and Positive affirmations. I will run strong at stadium run"
Step 3: Fake it, till you make it. Repeat it over and over, till you are truly convinced. I repeated it in some 3 time slots each day (mostly during my easy runs). I wrote it down about 25 times before I went to bed and 25 times just after for a fortnight. And so, at 6am on that Saturday, 6 Aug, I turned up at the start line, with unfazed nerves. I was hoping to stay fresh till noon and then take the second half as it comes. I was happy Navin chose to stay with me for most of this time. We stuck to a 25min run, 5min walk pattern, one salt pill at the top of each hour, one breakfast break (idly, kesari bath), lots of electral stops and one visit to the physio after 5.5hrs to stretch out the legs. 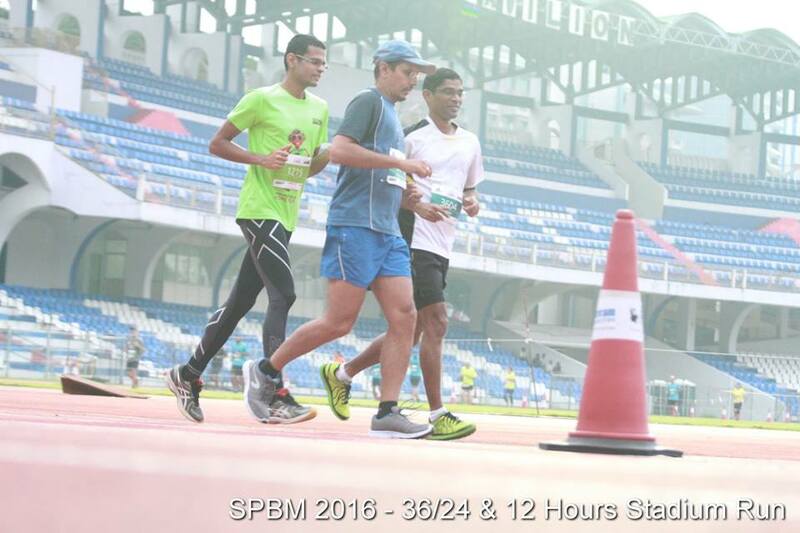 I had covered 46 - 42 - 37 laps or 18 - 35 - 50kms cumulative distance in 2 - 4 - 6hours. By this time, I was in the 7th place, but feeling fresh as per plan. My race had barely started. The sun began to open up now and I was constantly pouring water over my head to keep things cool. I tried to keep the focus on breathing easy, moving my arms & repeating my affirmations, whenever I was not chatting up with Navin, that is. I let Navin pace me and trotted behind for the next couple of hours. The next 4 hours was a bit of a mystery. The sun wasn't going away but I only began to feel better. At 7.5hr, Navin & I went in for our second physio pit stop. Sweta from ProPhysios loosened things up and was God send. When we got back and the 8hr standing were announced, I had moved to 3rd place. Navin was in the lead and very unhappy about that unsustainable pace. He began to drop his pace and I carried on. I had my second lunch of Pongal and Idly at 3PM. I surprisingly, kept good pace for this entire sun bathed fest. I took much smaller walk breaks, but slightly more frequently now. 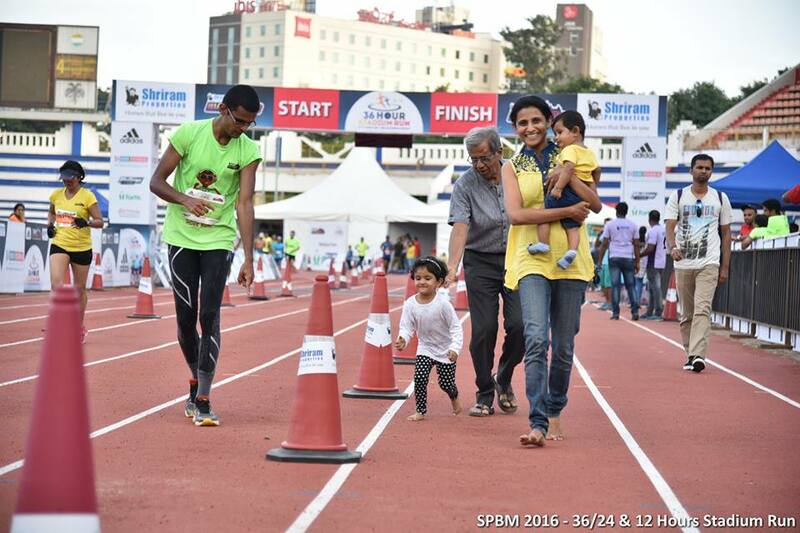 I will run strong at stadium run". So I stopped for another long stretching session after the announcement. With my daughter, Neha coming to see, for the first time, how her appa runs, I was more worried about making a bad first impression. I stayed sane and slow. I told Navin after 9hours that I was feeling very good. I completed 39 - 37 - 31 laps or 16k - 15k - 12.5k in the last 3, 2hr splits. My entire family turned up at 5PM, I was still gobbling sandwiches and my walking breaks with no podium plans whatsoever. I went off the center track to run the last 3-4 times with Neha and Shreya. I had enough time to strike a deal with the photographer at the other end of the track to take this one for us. With 20mins to go, Santhosh who had always advised me to hold back, asked me to let go. I gave up a stretching break to just ice some stiffening quads. 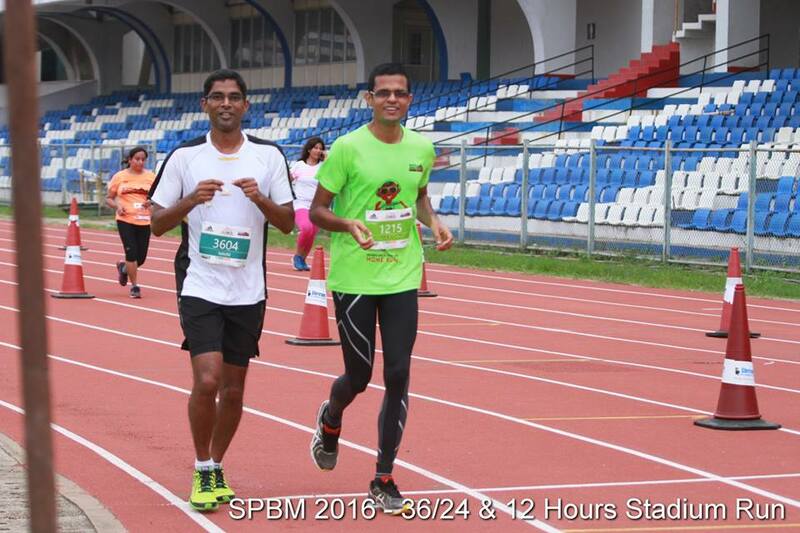 "3 more minutes to go", Ankush announced over the mic as I crossed the line for the 230th time. I knew if I crossed the line once before the bell, the last one would count too. As I turned into the final bend, I sprinted like a mad man, past the line, for one last loop. I kept the pace, that smirk on my face, pushing through the other runners, giving it all. 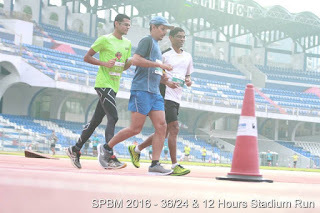 After picking up the medal and the photo shoot, I checked my laps 232 in all, 92.8kms and a 3rd place, the beat that was playing in my mind "I will did not cramp at stadium run. 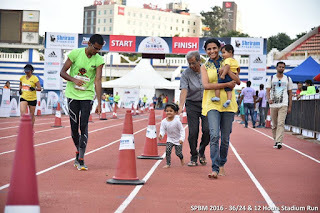 I did run strong at stadium run".